Bank Nifty bounced more than 900 points in last 2 sessions and also bounced about 400 points above its previous life time high 22978. 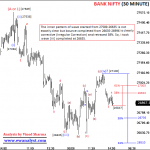 A new upside wave has been started from 22469 and we need to look again at previous waves. 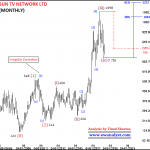 So, I am revising the wave counts on all time frames again in this report. This is monthly time bar chart of Nifty covering life time move of Bank Nifty. 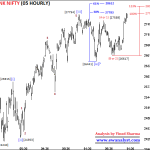 It seems wave (3) is in progress from 8366 on largest time frame whereas wave (2) seems Irregular Correction. 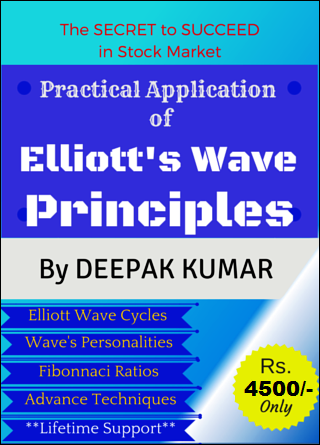 And within wave (3), it seems last wave (v) is in progress which achieved all its minimum requirements. Inner wave (v) of (3) is already extended after breaking above 61% projection 21157 whereas next 100% projection is at 25948. This chart is not going to help in calculating any confident upside levels because waves has already achieved minimum requirements on larger time frame. 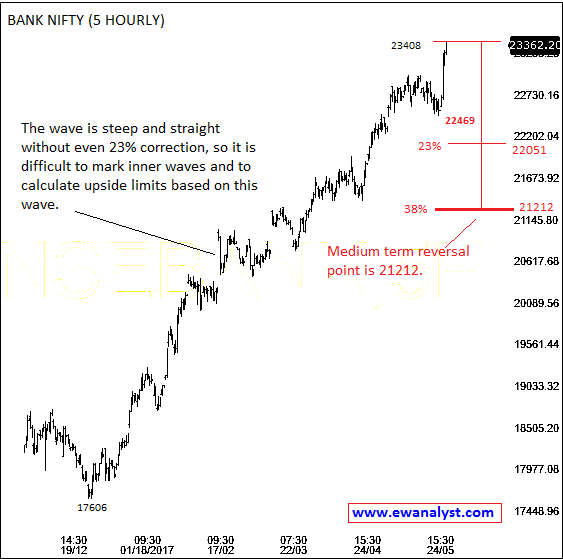 So, we need to analyze wave (v) separately on lower time frame to calculate further levels. 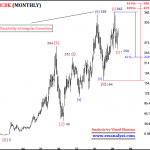 Normal 23%-38% retracement of progress of wave (3) is at 19858-17761. So, 38% retracement 17761 is breakeven or reversal point for long term. We should not worry about these levels at this point of time because it is monthly chart and it can take months or even years to confirm. So, we need to analyze wave (v) of (3) started from 13407 on daily chart. It seems wave 3 of (v) completed at 20575, 4 completed at 17606 and 5 in progress. Wave 5 also achieved 61% projection after achieving 22035 and next 100% projection is at 24774 which may or may not be achieved. Here again, this wave (v) also achieved its minimum requirement and wave 5 of (v) is already extended. So, this chart will not help to calculate further upside levels. So, l am going to analyze wave 5 of (v) if it can help. 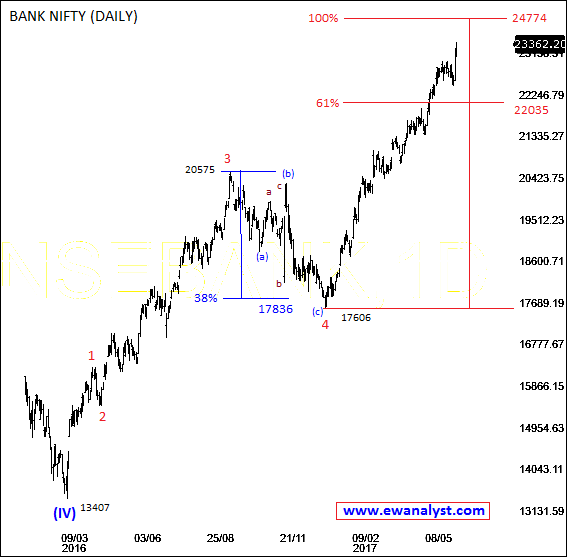 This is 5 hourly time bar chart of Bank Nifty covering bounce from 17606 which I marked as start of wave 5 of (v) of (5). This bounce started from 17606 is steeper and straight without even a 23% correction in between. I can identify many small impulsive waves within this bounce but it is difficult to conclude which wave is actually going on. 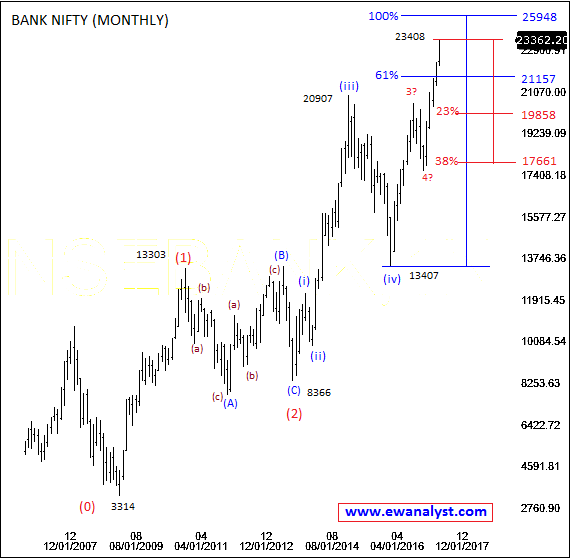 We need a reasonable correction to identify next wave and to calculate its levels but it is again difficult to calculate any upside range because I am not able to identify which wave is going on. But 38% retracement of this whole wave is placed at 21212 which is the point we can refer as medium term reversal point at this moment. So after look at all the above chart, we only have option to analyze very last upside wave started from 22469 on lowest time frame to calculate very immediate levels. 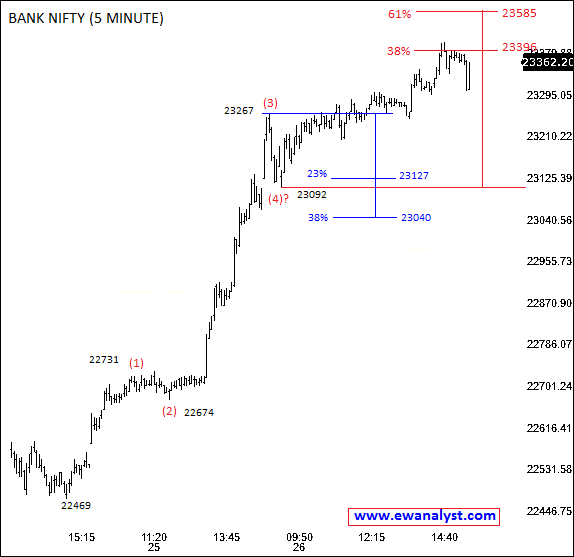 This is 5 minutes time bar chart of Bank Nifty showing bounce from 22469 which is the start of very last upside wave. It seems wave (1), (2), (3) and (4) are completed and (5) in progress. Wave (5) achieved its minimum 38% projection after breaking 23396 and next 61% projection is at 23585 which may or may not be achieved. Tough wave (5) achieved minimum 38% projection of pattern doesn’t seems completed. Wave (5) can be Impulse or ED only but I am not able to identify any of these two patterns within the bounce from 23092. 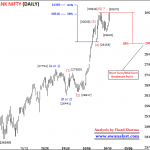 So, either Bank Nifty needs to move further higher to complete the pattern. But if Bank Nifty declines straightway from present levels without completing pattern then we can witness the bounce later for new high, and 23092-23040 will be the turning range in this case. All monthly and daily charts are not giving any idea to calculate further upside and we have to analyze very last wave started from 22469 to calculate very next move. 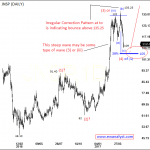 Bank Nifty has possibility to bounce higher from present levels to complete the pattern of wave (5). But if Bank Nifty declines straightway from present levels then 23092-23040 is the range from where Bank Nifty can bounce once again for new high. 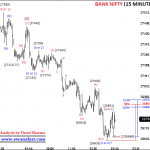 23040 is the levels which we can refer as reversal point of stoploss for longs. 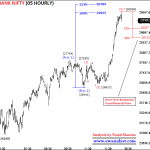 Bank Nifty already bounced more than 900 points in last 02 sessions in straight line without any reasonable correction. So taking any trade at this point is not safe and we need to wait for some correction and clear pattern for taking fresh low risk high reward trade. So, wait for some decline and a corrective pattern to form to initiate a fresh low risk trade. 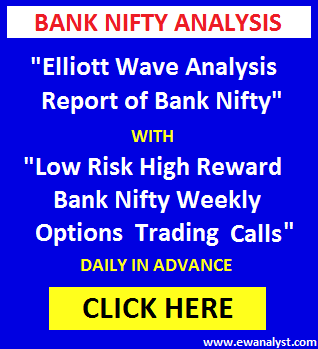 Otherwise, if Bank Nifty decline straightway towards 23092 again then small risk can be taken by buying Bank Nifty 22900 01 Jun Call in 23092-23040 range using stoploss of 22999 expecting target of new life time high.